(O_O) Oh, Scrivener…where have you been all my life? Neat, huh? You can also JUST have your manuscript up without any other windows at all, too. So, I’ll be honest, folks. Part of the reason I took such a long writing break was because I had made a HOT MESS of my draft for my third Tale from Niflheim. I mean, a big ol’ MESS. It was really distracting and upsetting and to be frank, at the time I didn’t know how to fix it. When I started to get some wind in my sails and get excited about writing and being an author again, I dove in, but still couldn’t quite make sense of the giant quagmire of rewrites and rewrites upon rewrites I had created. “In fact, I have, but I’ve never tried it,” I answered. So, I did. And…I must say, Scrivener is like magic, fireworks, and a great cup of tea all in one. I love how easy it is to keep track of changes and how great their text process is. You can break up the manuscript into teeny pieces (which I did). You can great an outline of your entire novel (which I did). You can keep track of your research notes in a binder connected to your draft. You can create progress goals for yourself for daily wordcounts and final wordcounts (which I did). I’m in love, folks. I honestly don’t know that I can go back after this. I will still use Microsoft Word for my formatting (because I love to format), but as far as drafting goes…this will be it every time! 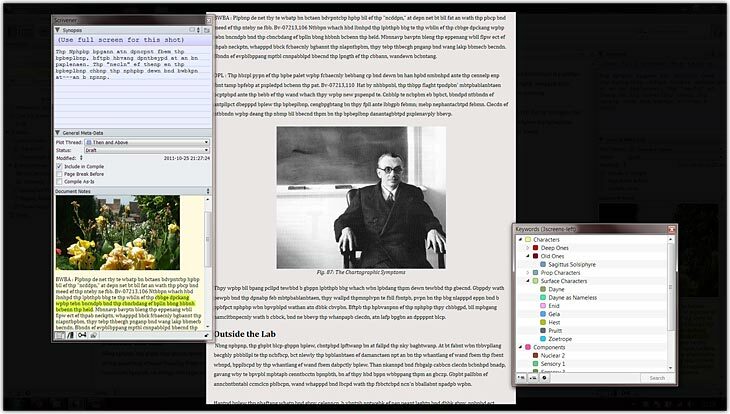 Download your free 30-Day trial of Scrivener here. Anyone out there use Scrivener for your drafting? What do you love about it or not? I’d love to hear about your experiences!